← Readers, I need your voice! Read the full article on the ARRL website. 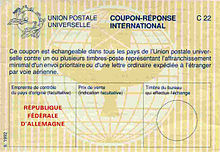 This entry was posted in Announcements, News and tagged International Reply Coupons, IRC, IRC Phased Out, QSL. Bookmark the permalink. I read earlier today that the UK post no longer offers them for sale.